The number of commercially insured children diagnosed with attention-deficit/hyperactivity disorder (ADHD) increased 33 percent from 2010 to 2017 in the Philadelphia region, according to a new study of medical claims by the Blue Cross Blue Shield Association (BCBSA). 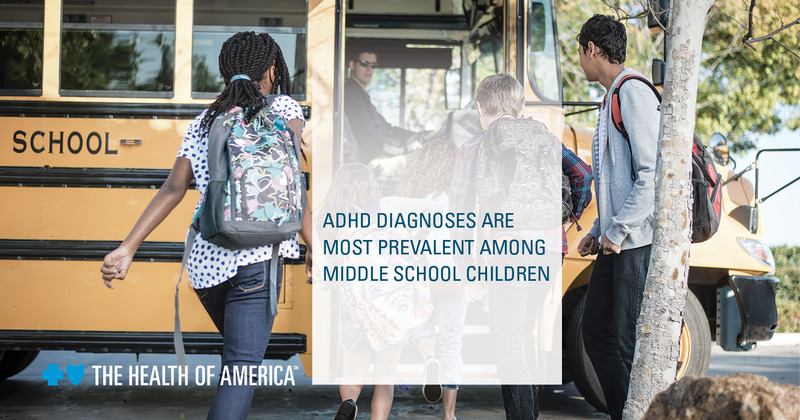 Nationally, almost 2.4 million commercially insured children were diagnosed with ADHD, climbing 31 percent. Part of the Blue Cross Blue Shield, Health of America® series, “The Impact of Attention Deficit Hyperactivity Disorder on the Health of America’s Children,” found that about 40 percent of children with ADHD across the country were also diagnosed with at least one other behavioral health disorder. Nearly half of children with ADHD in the U.S. were treated only with medication in 2017, though the report shows this number is beginning to decline. According to experts, the best way to treat ADHD is through a combination of both medication and behavioral therapy. ADHD is most prevalent among middle school-aged children (11-13 years old), and boys are diagnosed about twice as much as girls. Diagnosis rates are higher in the south and lower in the west, with a nearly three-fold difference between the rates of the highest and lowest states. ADHD accounts for 16 percent of the impact all health conditions have on Generation Z (0-19 years old). This is the 25th study of the Blue Cross Blue Shield, The Health of America Report® series, a collaboration between BCBSA and Blue Health Intelligence®, which uses a market-leading claims database to uncover key trends and insights into health care affordability and access to care. The report was done in partnership with HealthCore®, a wholly-owned and independently operated health outcomes subsidiary of Anthem, Inc. This report focuses on the diagnosis and treatment of ADHD among commercially insured American children 2-18 years old from 2010-2017. The study population was identified by ADHD diagnosis codes in Blue Cross and Blue Shield medical claims. For more information, visit www.bcbs.com/the-health-of-america. Independence Blue Cross is the leading health insurance organization in southeastern Pennsylvania. With our affiliates, we serve more than 8 million people nationwide. For more than 80 years, we have been enhancing the health and well-being of the people and communities we serve by delivering innovative and competitively priced health care products and services; pioneering new ways to reward doctors, hospitals, and other health care professionals for coordinated, quality care; and supporting programs and events that promote wellness. To learn more, visit www.ibx.com. Connect with us on Facebook and on Twitter. Independence Blue Cross is an independent licensee of the Blue Cross and Blue Shield Association. The Blue Cross and Blue Shield Association is a national federation of 36 independent, community-based and locally operated Blue Cross and Blue Shield companies that collectively provide health care coverage for one in three Americans. BCBSA provides health care insights through The Health of America Report series and the national BCBS Health Indexsm. For more information on BCBSA and its member companies, please visit BCBS.com. We also encourage you to connect with us on Facebook, check out our videos on YouTube or follow us on Twitter. The HealthCore name and logo are registered trademarks owned by HealthCore, Inc., a wholly owned and independently operated health outcomes subsidiary of Anthem, Inc.